Price isn’t everything, but perks matter too. As online stores, supermarkets, pharmacies, and department stores all vie for business, having a generous, and easy to use loyalty card club can make all the difference as to where people choose to buy their products, and recommend them to friends with referrals. Many offer bonus points upon signing, gifts when it’s your birthday, and special offers and discounts. Here is a selection of some of the main players and what they offer. CVS Pharmacy: Sign up online via the free ExtraRewards Card page, and then join the ExtraCare Beauty Club; that’s free too. You get 10% off when you sign up, $5 off every $50 you spend on beauty products and toiletries, $3 reward coupon on your birthday, and special discounts for members only. Often they will email random discount vouchers throughout the year, or will be printed out when you visit the store. 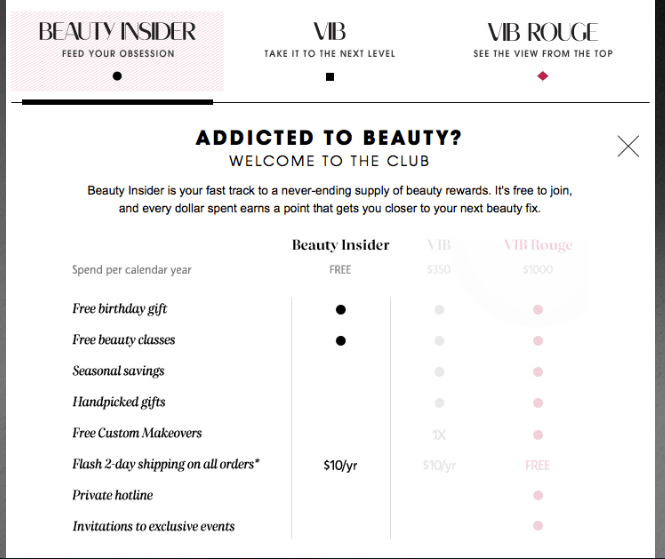 Sephora: The Beauty Insider Program, has 3 levels, the free membership, VIB (when you spend $350 a year), and VIB Rouge (when you spend $1000) a year. The club offers a free birthday gift, discounted shipping, custom makeovers, and you can exchange your points for special sized samples from 100 points. A dollar equals a point, and there are also periodic bonus points offers. Walgreens and Duane Reade Pharmacies: The Balance Rewards program allows you to build up points in exchange for money off your next purchase where 1,000 points is worth a $1, but points do expire after 6 months if you don’t use your card. There are usually bonus points on offer for beauty products, so you can easily build up discounts if you buy several items. In addition some discounts and specials are only available to cardholders. Rite Aid Pharmacy: This pharmacy offers more discounts on cosmetics and beauty products with coupons and their Wellness and Plenti card. You can add coupons to the card and then use them in store or online. However, you can only get the discounted prices with a card, so it’s worth signing up for one in case you need a bargain. Macy’s is also part of the Plenti card program so points can accumulate quickly, as other vendors such as at&t, and enterprise are also partners. The Body Shop USA : The Love Your Body rewards program costs $10 a year to join, but can pay for itself. The benefits are; 10% off qualifying purchases, a $10 birthday reward, and at times they offer free memberships online with a specific spend. Each purchase over $20 gets one point, or over $50 you can get two points (a maximum of 2 points a day). Once you get 4 points you get a $15 reward, and a $25 reward with 8 points, plus free membership renewal. drugstore.com dollars™ Program: In conjunction with beauty.com you automatically get 5% credit in your account from qualifying purchases. The program is quarterly, so you must use what credit you have earned within a month after that quarter, or forfeit it. Bloomingdale’s Loyallist Program: For 5,000 points you get a $25 reward card valid on all merchandise. For each dollar you spend you get between 2-8 points (depending on whether you pay by a store card) for beauty products. The CVS ExtraCare Beauty Club is quick and easy to sign up for. Even if you don’t manage to spend $50 in a year, they still email you discount coupons to use on beauty items that you can use with other coupons. Items such as hair care and soap are included, so it can be quite easy to buy the essentials and get the $5 coupon. Sephora is also very easy to sign up for and points don’t expire (except for VIB memberships), and you can pick up your birthday gift in store with a purchase if you don’t want to shop online. Walgreens and Rite Aid are little more complex, with more exclusions; however, the cards are worth having, as some specials are only available with a card. Both pharmacies have changed their loyalty programs in the last couple of years, probably because people found them too complicated to use. Personally I have only used the cards for discounts, because my points would expire too quickly, and I didn’t think it wise to spend for the sake of keeping them. I’ve had a Body Shop Love My Body card for a few years, but there are several exclusions for the 10% discount, so you must read the small print. The card does pay for itself with your birthday reward, so don’t be put off by the cost, join in your birthday month to get the maximum instant benefits. Loyalty cards are supposed to keep us going back to a store, but they are a bonus, and if the program has too many rules, exclusions, or is complicated to use, then people won’t bother for the sake of bonus points. They also help stores to promote new products, and the customer benefits with rewards and discounts. There is the temptation to buy more (their aim), with bonuses and gifts, but choose wisely; get rewarded for what you would have bought already.